Montclair’s Mexican restaurant, Villalobos, features traditional ingredients with modern technique. Their selections go beyond just tacos. Chef-Owner Adam Rose’s menu at Villalobos is seasonal and delicious. Typically, when a venue advertises $1 tacos, the taco itself will likely not be as enjoyable as the deal. 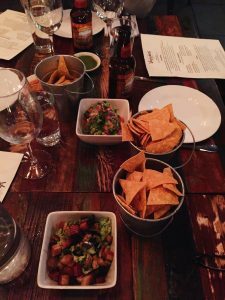 At Villalobos, Montclair’s traditional Mexican restaurant, the dish is every bit as exciting as their new Taco Happy Hour venture. 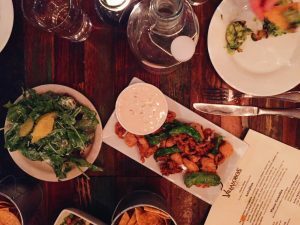 This marriage of traditional and modern is no more apparent than stepping into Rose’s Church Street-area restaurant, located in the heart of Montclair Center. The spacious dining room is filled with exposed light fixtures and subtle Mexican details like Georgia O’Keefe-style antlers and spiny cacti. I prefer to sit at the bar, which offers the best view of the open kitchen. Villalobos partner and VJ Moscaritola and interior designer Ashley Rose (Adam’s sister) are credited with much of the restaurant’s design process. Changing his menu at least four times a year to highlight seasonal ingredients, Rose incorporates traditional Mexican dishes with his own contemporary spin. 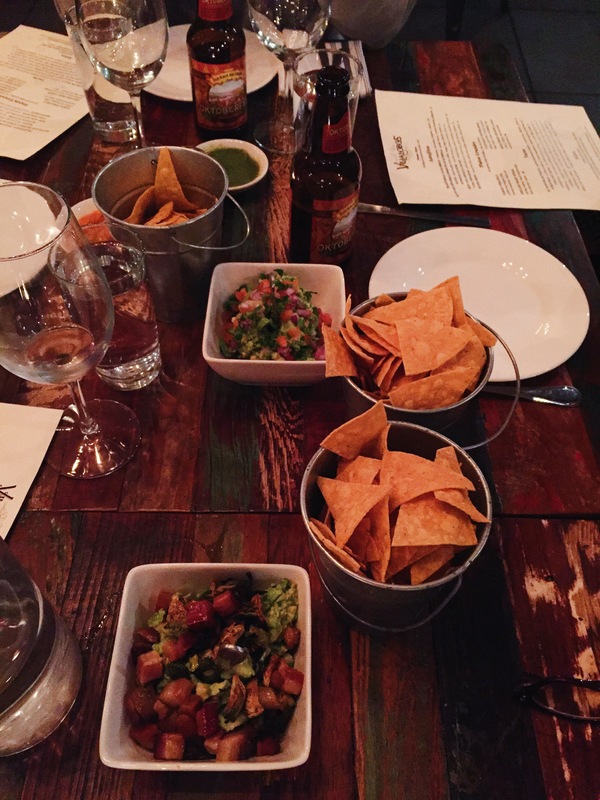 Small plates at Villalobos are “Antojitos” (Mexican street food or, “little cravings”). I start with a classic: guacamole. Rose’s Traditional Guacamole ($10) is creamy, fresh and just a little spicy with the addition of slivers of jalapeno. However, the Smoked Bacon and Roasted Brussels Sprouts Guacamole ($13) is truly a bite to be remembered. I rarely need chips as a vessel for guacamole at Villalobos, though propriety encourages me to use a fork as opposed to my preferred finger-method. Elote ($10) is a sweet and tangy dish typically made with local bi-color corn, but upon my last visit the corn was swapped for seasonal squash. The dish was accompanied by grainy cotija cheese and chipotle morita peppers. Salad at Villalobos is peppery and earthy with the Beet and Arugula ($10) offering. A colorful precursor to stuffing oneself with tacos, the addition of pistachios and sliced orange render the dish as pleasing to look at as it is to munch on. Here’s a secret: I prefer to compose my main meal at Villalobos purely through tacos, made on Rose’s housemade tortillas. While entrées offered are quite special – I’m partial to the burger ($9), made with chorizo and beef – I prefer the variety available via Villalobos’s tacos. 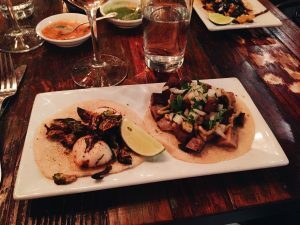 The Grilled Scallops taco ($7) is creamy and rich with velvety scallops and sweet creamed corn. If a classic fish taco is desired, the Pescado Frito ($6) is a safe bet with beer-battered cod, cabbage and crema. The Lengua Taco ($6) features tiny cubes of beef tongue, each bite containing just the right levels of fatty and vinegary meat. Personally, my taco-vote goes to the Cochinita Pibil Taco ($6), a traditional slow-roasted pork with tart pickled red onions. I recommend trying as many tacos as you can, a feat most affordably achieved via Rose’s new Taco Happy Hour. Tuesday through Sunday, from 3 to 6 p.m., Rose invites diners to enjoy three tacos for $3. Can’t leave the office for a sit-down meal at that time? If you’re in the South Fullerton Street area, you’re in luck: Villalobos provides delivery to patrons within walking distance (there’s always a takeout option regardless of location). Villalobos is located at 6 South Fullerton Avenue in Montclair. They are reachable by phone at 973-337-6667. Visit their website, villalobosnj.com, for more information. 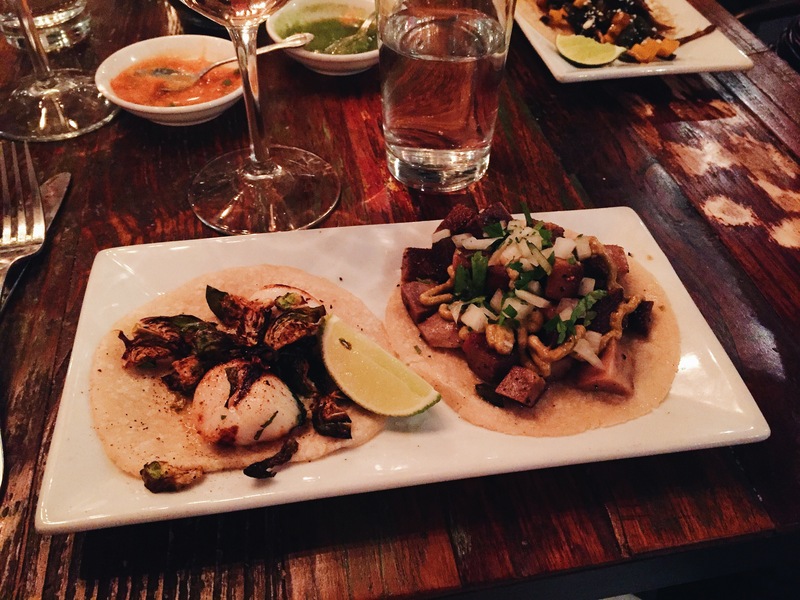 Recommended dishes: Daily specials; Smoked Bacon and Roasted Brussels Sprouts Guacamole; Elote; Cochinita Pibil Taco. Drinks and wine: BYOB; Pre-mixed virgin margaritas are available for the doctoring-up if desired. Hours: lunch served Tuesdays through Sundays, 11:30 a.m. to 4:30 p.m. Dinner served Tuesdays through Thursdays, 4:30 to 10 p.m.; Fridays and Saturdays, until 11 p.m.; Sundays until 8 p.m. Taco Happy Hour offered Tuesdays through Sundays, 3 p.m to 6 p.m. Closed Mondays. Parking: There is on-street parking, metered and unmetered, nearby. Reservations: Accepted online or by phone. Recommended for parties of five or more. Credit card: All major cards accepted. Wheelchair access: Restaurant is on one level. There is a restroom. Bonus Tip: Check out Taco Happy Hour to affordably take advantage of Rose’s menu: three tacos for $3, Tuesdays through Sundays.